Kamlesh Suthar (AES) arrived at Argonne in September 2009 as a postdoctoral researcher at the Center for Nanoscale Materials (CNM). Since then he has advanced through the ranks at Argonne to become a Mechanical Engineering Specialist. As a postdoc, first at the CNM and then at the APS, he has performed a remarkable level of research and has made some amazing discoveries. While at the CNM he developed a new methodology to characterize and synthesize Ferrogel. At the APS he synthesized unique nanostructured materials such as polymer brushes on nanoparticles and developed characterization methodologies for nanocomposite materials. He has worked extensively with soft polymers, designed and fabricated masks and used many different forms of X-ray lithography ranging from extreme ultraviolet radiation, soft X-ray, hard X-ray and deep X-ray forms. Kamlesh has produced microfluidics devices for X-ray characterization and developed an acoustics based sensor that can levitate liquids for research. Left to right: Levitating foam balls in acoustic field, levitating water mist particles and levitating water droplets. Kamlesh’s research has not gone unnoticed. His work on acoustic levitation was recently featured in COMSOL News in the article “Floating on Sound Waves with Acoustic Levitation.” The acoustic levitator mixes pharmaceuticals in a contaminant-free space without a container. The chemicals are levitated with sound waves between two small piezoelectric transducers with a layer of foam. This method of mixing medicines is highly desired by the pharmaceutical industry because it allows chemists to control the droplet size, concentration and chemical in each pharmaceutical developed. Kamlesh was responsible for designing and engineering the levitator. He ensured the sound wave created was well-defined, suffered no interference and could properly create a levitating effect. He took into account such features as drag, gravity, droplet interaction and surface tension to produce a final product with an effective wave pattern. 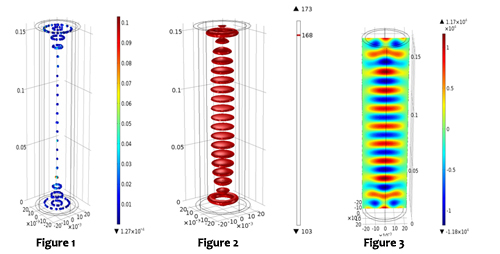 Figure 1: Simulation result of levitating water particles in acoustic field velocity field is in m/s, Figure 2: Simulation result of sound pressure level (in dB) for levitating foam balls in acoustic field and Figure 3: Simulation result of acoustic pressure (in Pa). His team composed of Physicist Christopher Benmore (XSD) and XF Engineering Group Leader Patric Den Hartog (AES) used COMSOL Multiphysics simulation software to develop the levitator. The team ran several simulations to define and improve the acoustic field distribution. Kamlesh analyzed the levitating phenomenon experimentally using particle imaging velocimetry combined with high speed imaging and numerically with finite element analysis so the droplets are pushed to the center and can properly achieve the necessary spherical shape. The acoustic field created causes the droplets to stay in a vertical position. This new tool could transform how pharmaceuticals are developed and manufactured. 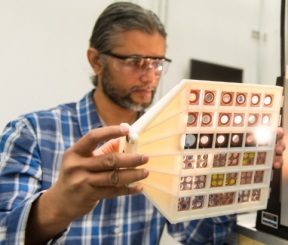 Kamlesh has also developed a vibrant 3-D printing program at the APS where researchers can send in horizontal strip sample holders designed with a 3-D printer. The polymer sample holders are composed of various sizes of solid, liquid, gel, metal and semi-solid materials. The new program saves several hundred to several thousand dollars per sample, reduces sample processing time and improves beamtime throughput, enhances user safety by avoiding ad-hoc tools, enhances the laboratory environment, and allows researchers to mail-in samples and see the results remotely. 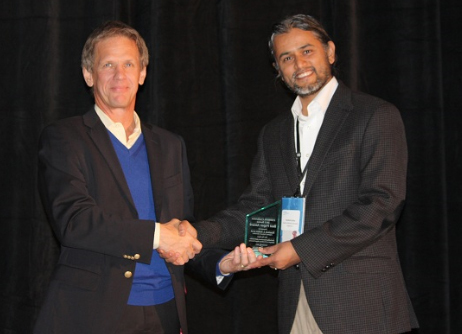 Recently Kamlesh received an award for Best Paper at the 2013 COMSOL Conference in Boston, MA, for his work with hydrogels. His paper “The Swelling Responsiveness of pH-Sensitive Hydrogels in 3D Arbitrary Shaped Geometry” provides a great understanding to the swelling characteristics of hydrogels, which can increase up to four times their size, as a function of their pH. Kamlesh was able to couple the participating physics together with the Arbitrary Lagrangian-Eulerian (ALE) method for moving mesh and predict the eventual shape of the hydrogel at a certain pH. Today Kamlesh is busy with design and development of various instruments and processes based on nano materials using a material science and engineering approach. Currently, he is developing and executing the mechanical designs for synchrotron radiation beamlines and experimental apparatuses for the APS. His role as a Mechanical Engineering Specialist not only allows him to perform engineering analysis, but he also is developing and implementing R&D programs for synchrotron instrumentation, particularly in the area of materials design utilizing nanomaterials. This type of work gives him the opportunity to collaborate with other scientists, engineers and researchers from multiple groups and divisions at the APS. Kamlesh Suthar (AES) is a Mechanical Engineering Specialist. He holds two masters in Mechanical Engineering from Western Michigan University and Gujarat University. He holds his Ph.D. in Mechanical Engineering from Western Michigan University. Kamlesh has published more than 18 papers in numerous scientific journals such as the Journal of Magnetism and Magnetic Materials and the Journal of Physical Chemistry B. He is an active member of numerous groups and associations such as the American Society of Mechanical Engineers, Magnetism and Electromagnetics Interest Group and the International Society for Optics and Photonics (SPIE). This entry was posted in Postdoc Spotlight and tagged acoustic levitation, COMSOL news, kamlesh suthar. Bookmark the permalink.